Chapter 13--Casi, Cookie, and Coyotes. This chapter does not have a happy ending, except to say that it is rare that coyotes kill domestic pets. In records of over 3,000 lost pets over a 7 year period, fewer than 5% were proven to have been killed by coyotes, and over 70% of missing pets were found alive and healthy. In almost every lost pet case, someone told the owners of that pet that there was no point in looking because the pet was definitely killed by coyotes. Those people were wrong most of the time. Still, it does happen, and although it does not make for pleasant reading, pet owners would be able to keep their pets safer if they understood the pattern of coyote predation. Also, knowing the truth about coyotes can help you sort out myth from fact when you are searching for your lost pet. In October of 2010, Kelsy and I went to search for a 15 pound Shih Tzu named Casi. He was 8 years old at the time of his disappearance. His owner was right at the back door, before dawn, and had just let him out into the yard. There was no noise, no reason to think anything was amiss, but Casi just vanished. They lived in a gated community on a golf course, and they knew all their neighbors. As they searched for Casi, no one reported seeing him. When Kelsy worked the scent trail, she followed a meandering course about half a mile away from this home on the golf course, to a patch of woods. We reached a dead end on the scent trail there, so we tracked it back to the point of origin and found a short branch of the scent trail we had passed on the way out. As Kelsy sniffed at something on the lawn, my brain finally started to register what I was looking at. Of course, we were looking for a dog, so it took me a few moments to realize I was looking at a section of intestine. I had never actually seen the remains of a dog, so it was the first time for both Kelsy and me. I let the owner know of my finding, and I collected the evidence in a plastic bag for DNA testing. I couldn't tell, just by looking at the remains, if it came from Casi, or even it was a dog. For all we knew, a coyote had killed a rabbit there. The results took weeks, but it was confirmed to be the remains of Casi. Kelsy found this evidence just about 100 feet from the back door where Casi's owner waited for him to come back in after an early morning bathroom break in the fenced backyard. The predator had attacked so quickly and quietly that the dog never knew what happened and the owner was completely unaware of anything going on. The night after the search, I was awakened in the middle of the night by Kelsy yelping and thrashing in her dreams, having a nightmare. This was the first and only time in Kelsy's life that I was aware of her having such a frightening nightmare. I stroked her gently and tried to reassure her without waking her, hopefully turning her nightmare into a more pleasant dream. In March of 2011, Kelsy and I went to search for a small dog named Cookie. She actually looked a lot like Casi, although the owners never specified her breed. She weighed about twelve pounds, and she had limited mobility due to age and illness. Her owners waited at the front door while they let her out after sunset one night. They saw her about thirty feet away, sniffing around for the perfect spot, and then she was gone the next time they looked over. They searched immediately and could not find her. Cookie was wearing a pink jacket at the time of her disappearance, so the neighbors surely would have noticed her if she had gone wandering. Kesly and I started searching on a Sunday morning. I thought Kelsy would follow the scent trail up the driveway and into the neighborhood. Instead, she immediately looped around the house, through the backyard, into the neighbor's backyard, and then into the woods. Kelsy pulled hard at first, indicating she had a strong scent. Along the trail into the woods, Kelsy slowed as she followed the scent over a log. On the other side, Kelsy carefully sniffed at the pink jacket Cookie had been wearing. It had patches of blood. We also saw a section of intestine, so that ruled out the possibility that Cookie was alive somewhere without her jacket. Cookie's owners had thoroughly searched this area before we came, but they were looking for Cookie, not for remains, so this evidence did not register in their minds. The pink jacket was found about 150 feet from the point Cookie was last seen. In this case, as with Casi, there had been no noise or indication of a struggle. Most likely, Cookie died instantly, and never knew what happened to her. 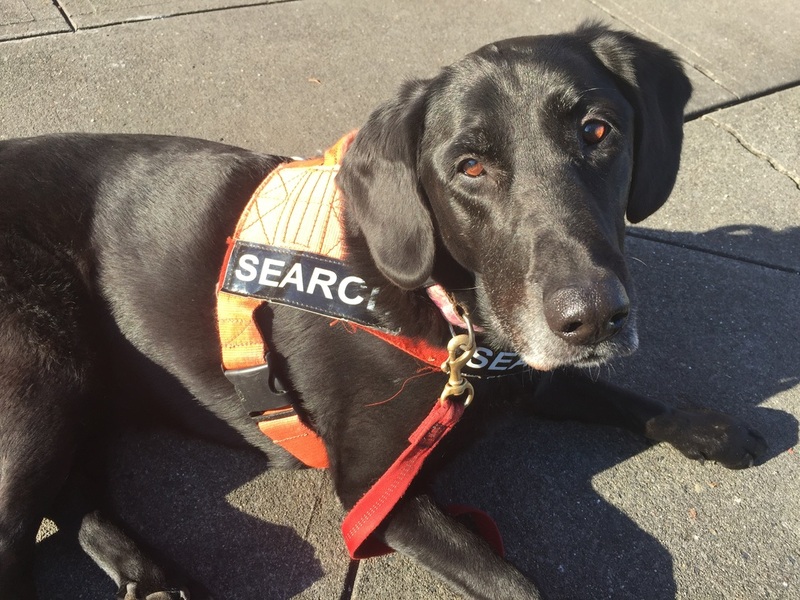 In seven years of searching for pets, Kelsy, Komu, and other search dogs I have worked with, such as Karma, have found remains of cats and small dogs about 100 times. Mostly, the evidence suggested they were killed by coyotes, but in a few instances the evidence pointed to a Great Horned Owl or a bobcat as the predator. In the cases where small pets were killed by coyotes, we almost always found evidence of predation within 150 feet of the point the pet was last seen. In all but a few of those cases, the cat or dog was there one moment and gone the next, with no noise or sign of a struggle. For most of these cases, the pet disappeared around dusk or dawn, although a few disappeared at other times of day. Almost every time, the amount of evidence left behind was so small that people searching for the pet had walked by it several times without seeing it. In some instances, the amount of fur left behind was so minor that I had to use a chemical test called Luminol to check for blood left behind at the scene, to confirm that the pet was killed at that spot. It is rare that coyotes kill pets, but my experience reveals a definite pattern. I know there are coyotes in my neighborhood. I have seen them. There are coyotes in almost all neighborhoods in the greater Seattle area. Vashon Island reportedly does not have coyotes, presumably because they were all killed off at one point in history. Although coyotes are everywhere, most of the time they prey on rabbits and rodents, and leave cats and dogs alone. When one coyote does start killing small pets, he usually continues to do it, and there will be a rash of fliers on telephone poles in the area for missing cats and small dogs. My little Fozzie is about 13 pounds. I never let him outside unattended, and he is always on a leash, right near me. Perhaps the risk to him would be relatively small, since only a small proportion of missing pets are the result of coyote predation, but I won't take that risk. Fozzie is always on a leash, a short leash, when he is outside. Letting your small dog out into a fenced yard does not really protect the dog from coyotes because they can sail right over a six foot fence with ease. Knowing what I know, I would not let a small dog outside unattended. Of course, I recommend to all cat owners that they keep their cats inside all the time. Indoor-only cats live twice as long as outdoor-access cats, on average. If your cat or small dog is missing, you should not jump to the conclusion that a coyote is responsible. It is possible, but almost every other eventuality is more likely, and assuming your pet was killed by a coyote could prevent you from looking for your lost pet in the most productive ways. If your pet was killed by a coyote, a search dog's nose may be the only way you would ever find evidence of what happened. If you have solid reasons to suspect your pet was taken by a coyote, and your pet was wearing a collar, look for the collar within a radius of about 200 feet from the point where the cat or dog was last seen.